Join us for some traditional festive fun from 11am to 6pm on Sunday 2 December 2018. 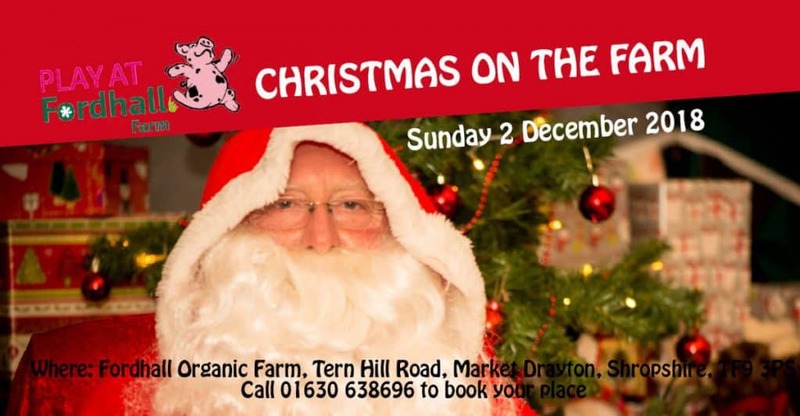 Father Christmas himself will be in our special Grotto and visits are just £5.00 per child. (slots must be pre-booked by calling us on 01630 638696 or emailing project@fordhallfarm.com) There will be Christmas crafty activities and seasonal fun throughout the day finishing off with carols and mulled wine from 4pm to 6pm. This period is ideal for anyone looking for a bit of festive cheer so please do come and join us! No charge for entry only refreshments. Online Bookings for Father Christmas now being taken! Simply click the ticket link under the event. You have the choice to book session 11am -1pm, 1pm – 4pm or 4pm-6pm – we will advise you of the exact 10 minute time slot allocated to you by email after booking. If you book multiple tickets at the same time/under same order you will all be given the same time slot. Book now to avoid disappointment! Category | Bookmark the permalink.